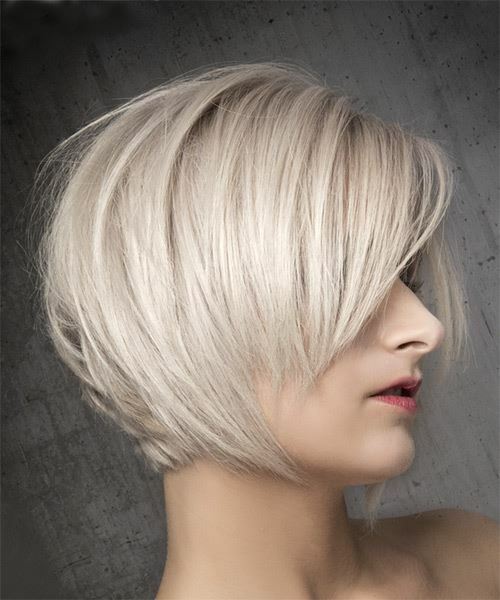 This windblown blonde bob is blow-dried perfectly to smooth down the top while turning the ends slightly under for a fabulous finish. The layered long bangs are worn swept across the forehead to frame the eyes and complete the overall look brilliantly. Subtle backcombing adds extra body and bounce all over, making this an ideal 'do for fine hair. Regular trims are needed to maintain this hairstyle, as well as regular toning treatments to keep the color looking silvery cool. Use mousse and a large round brush to blow dry this style into place.